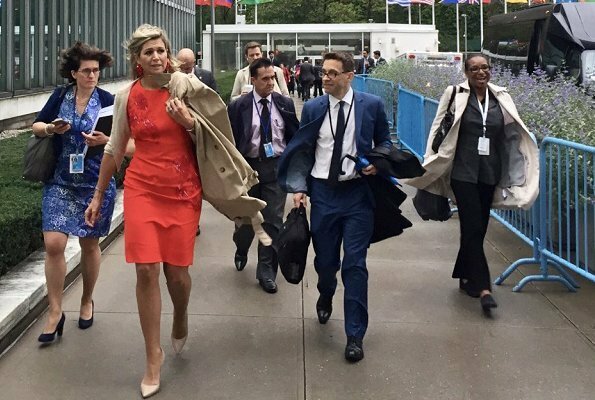 Queen Maxima of The Netherlands visited New York to attend UN General Assembly. The Queen attended a series of events and meetings during her visit to New York. 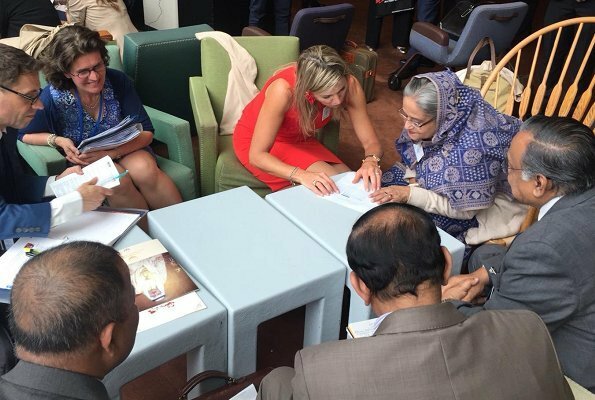 Queen Maxima attended a meeting of the Women Entrepreneurs Finance Initiative. This initiative, under the supervision of the World Bank, focuses on better financing for female entrepreneurs in developing countries. The Queen is in her capacity as special UN advocate for inclusive financing for development. 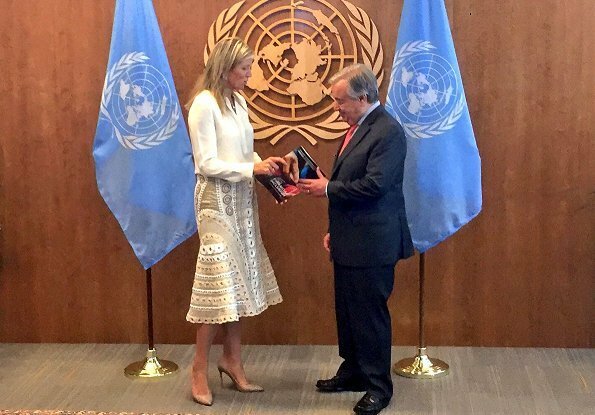 Queen Maxima met with United Nations Secretary-General Antonio Guterres at the United Nations in New York on September 26, 2018. What good are fancy bracelets, watches and earrings when your hair looks like you just got out of bed? Gabriela you are so right but I guess she's hopeless with those hair; it seems she is convinced that with loose hair she will look better but I believe she would look more put up with a simpke bun made by herself. Maxima has enough charisma to over shadow bad hairs and everything. Wow a Natan I actually like. The orange dress is great, nice fit, style, and color on Maxima. I also like the second dress, could do without the fur-like trim. 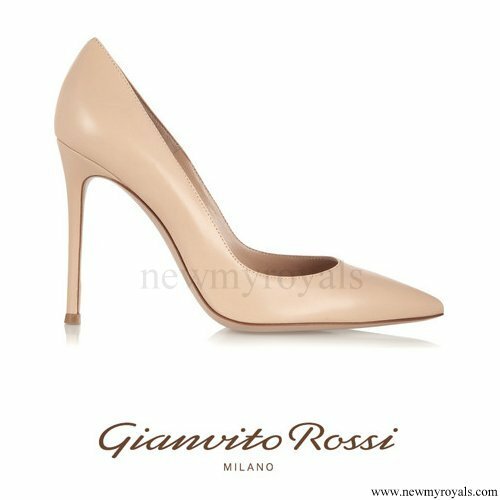 I usually like what Ivanka wears, but this is not her best. The jacket is too boxy and big. 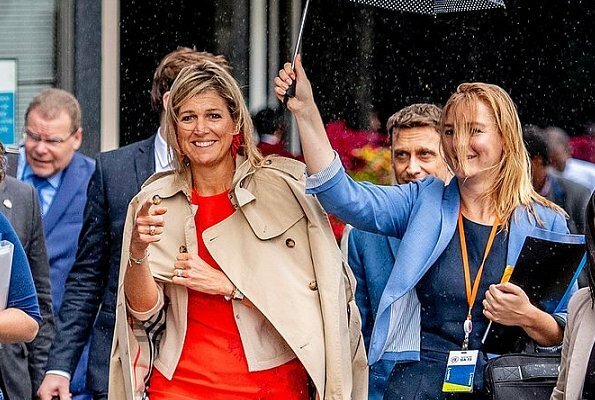 Wish Ivanka could give some hair tips to Maxima. 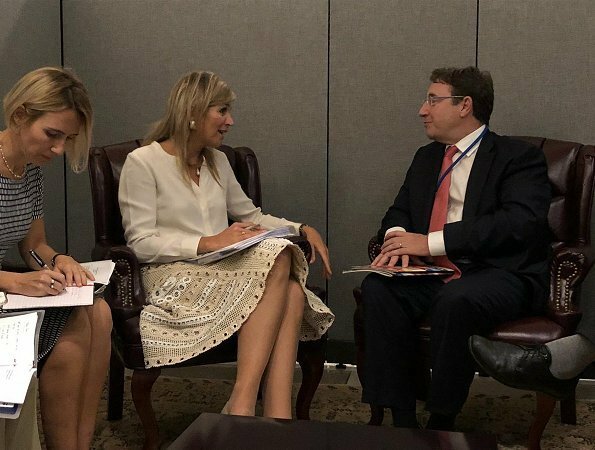 If Maxima's hair looked like Ivanka in these pics, she would look sensational. I'm really curious as to why it seems like Maxima does not care about how her hair looks. Its obvious she puts lots of time and effort into her clothing choices. Like I said, it's easy to look at these pictures and judge, but you have no idea what the actual environment state was here. This wasn't her fault, it was the absolute crap week of weather we had! Queen Maxima looks beautiful and actively busy.Ivanka has no sense of style or allegiance .I don't like her suit and heavy makeup . On the contrary. Ivanka is known for her excellent sense of style. If this supposed to be a political statement, this is not the place for it. Thank you chardonn8r, totally agree with you. It was raining and obviously very windy that day. I'm not as bothered as usual by her hair. Ivanka's hair looks fake, like Barbie's hair. Both are dressed very appropriately for the occasion. Really nice. Q Maximas red dress looks great,a bit windy in NY today oh well it is fall. Maximas second dress with the fur or what ever it should be is not that wow, with the coat on yes love her big rimmed hats. 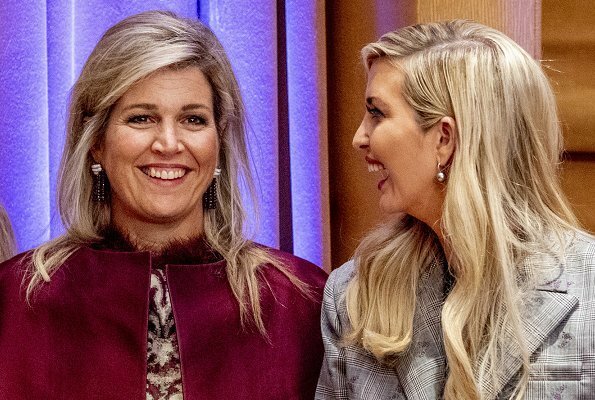 Love the warm greetings between Maxima and Ivanka. Two beautiful Ladies. 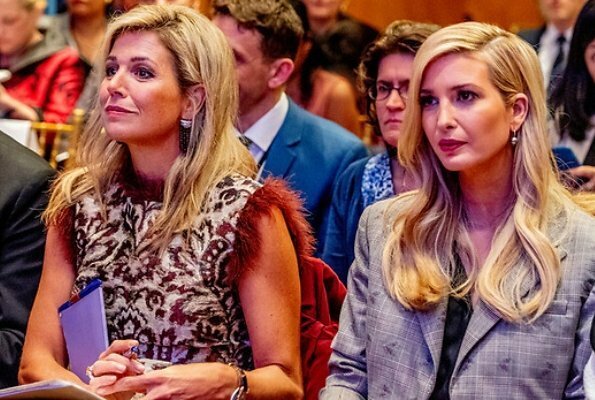 Ivanka looks very well put together, her hair is beautiful especially in contrast with the mess that is Maxima's hair. To be fair, it was a windy and rainy day in New York and Maxima is not the only lady with a mess hair because of the weather, however her spontaneous personality and good attitude overcome her bad day hair. Indeed miserable hair day. Would have been much better to make a ponytail when seeing such a windy weather coming. Obviously she cannot see how bad her hair today looks. Too much bleaching and her hair cannot stand so much official hair up-does with beehive and chemicals. I would like Maxima's second dress so much more if it didn't have the fur. I do like the coat with it. I am okay with the third outfit, and don't care for the first dress at all. It has a cheap look to it. Her hair gets a well deserved pass this time due to weather. And you can never go wrong with a classic Burberry trench. 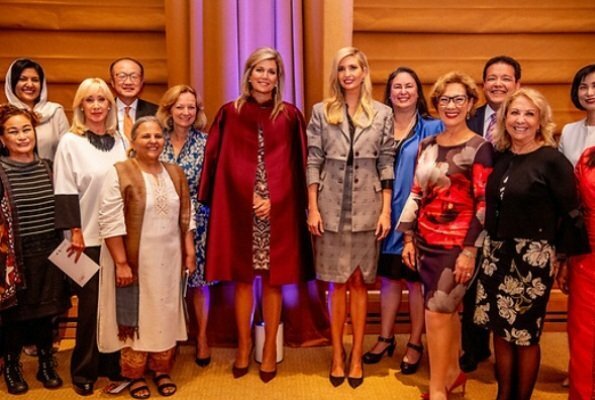 I love the way Maxima and Ivanka are interacting.